Business Insurance America interviews Firestorm Partner McGowan Program Administrators regarding their Deadly Weapons Insurance product. Last Friday evening, 20-year-old Arcan Cetin grabbed his rifle, drove from his hometown of Oak Harbor, Washington to the nearby town of Burlington, entered the Macy’s store in the Cascade Mall and opened fire. By Saturday morning, five people were dead. This latest mass shooting is part of a disturbing trend in mass violence inflicted in the United States. From 2000 to 2013, the FBI measured 160 active-shooter incidents, defined as an individual or individuals “actively engaged in killing or attempting to kill people in a confined and populated area.” During the first seven years of the data set, 45 such events were recorded; that ballooned to 115 events during the last seven years. Around the outbreak of violence, an emerging insurance market has sprung up. With new active shooter products from mainstays in Europe to homegrown programs in the US, insurance agents already have a variety of options in an area some underwriters believe will become just as vital to the average commercial account as cyber or employer professional liability coverage. These policies are so new – most introduced just this year – that there is no “industry standard” coverage. However, most provide cover for active shooter incident services both before and after the loss. This can include liability, business interruption and coverage for counseling and crisis management services, among other features. Interest in the products is widespread, with inquiries pouring in from across the country and among all classes of business, says Paul Marshall, program manager for McGowan Program Administrators’ new Active Shooter Division. It especially surges after incidents of mass violence hit the headlines, such as Friday’s Cascade Mall shooting. Marshall believes the market response will only increase as mainline carriers begin specifically excluding active shooter and mass violence-related events from general liability policies. Some carriers have already begun [read the rest of this article at Insurance Business America]. 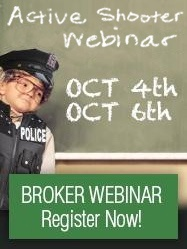 Are you a Broker and want to learn more?